Increasing demands for irrigation, domestic and industrial water have generated a massive growth world-wide in the number of large water infrastructure projects involving the transfer of water from basins considered to have surplus water to those where the demand for water has exceeded or is expected to exceed supplies. Using the experiences of projects in Australia, United States, Canada, China and India, this book examines case studies within the diverse geographical, climatic, economic, and policy regimes operating in these countries. It examines the water resources of Australia, the driest inhabited continent, and explores inter-basin water transfer projects in the United States, Canada, China and India, examining their benefits and impacts within these nations' contrasting economies and governance systems. This comprehensive and well-illustrated text will be of great interest to professionals and researchers in the fields of hydrology, water resources, and to those engaged in environmental science, policy and regulation. 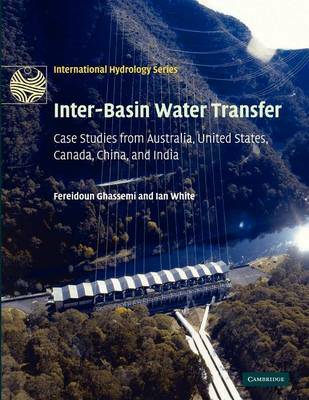 Buy Inter-Basin Water Transfer by Fereidoun Ghassemi from Australia's Online Independent Bookstore, Boomerang Books. Fereidoun Ghassemi is Visiting Fellow at the Centre for Resource and Environmental Studies, The Australian National University. He is a Fellow of the Modelling and Simulation Society of Australia and New Zealand and was recipient of the G. Burton Medal from the Hydrological Society of Canberra in 1995. Dr Ghassemi has more than 35 years of experience in various aspects of water resource research in Australia, France, Iran and Vietnam. Ian White is Professor of Water Resources at the Centre for Resource and Environmental Studies, The Australian National University. He is a Fellow of the American Geophysical Union and the Australian Academy of Technological Sciences and Engineering. Professor White was awarded a Centenary Medal for service to Australian society in environmental science and technology in 2003 and has twice (in 1994 and 1997) received the G. Burton Publication Medal from the Hydrological Society of Canberra. He has worked in water and land resources in Australia, the United States, Pacific small island nations, Vietnam, China and France.